We have all heard the saying—the best weapon is the one you have on you when you need it. 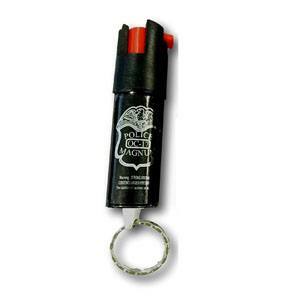 Carrying the best pepper spray is a great, non lethal weapon for self defense. 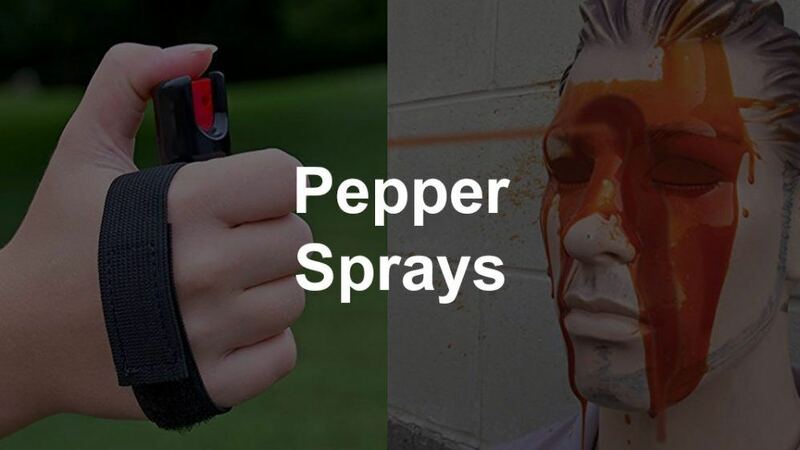 Pepper spray is not only simple to use; it is extremely accessible and affordable. It's easy to find one that will fit seamlessly into your lifestyle. The key thing to know is that there are sprays and gels. Sprays are easier to use at closer range, but they can blow back on you easier. Gels come out in a thicker solution, so they are better at longer range, and don't get back on you as easy. Then there is the chemical stuff.​ The three types are red pepper, CS military tear gas, and UV dye. Some units will have one, and some have a combination of the three chemicals. Another thing to remember is that pepper sprays do have an expiration date. Make sure and keep track of the dates on yours so that you can replace them before they expire. With so many choices out there, it can become pretty confusing on which one to get. Luckily, I did a ton of research and found the best of the best. In this article, we are going to look at the top 10 best performing, most popular, and cost effective units out there.​ Pepper spray is one of many ways to defend yourself while you are out in the field, as well as for home security. 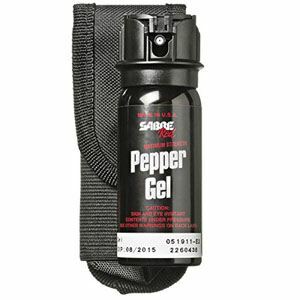 SABRE Red’s Runner Pepper Gel with an adjustable hand strap comes in black or pink. The strap is made to loop around your hand so you can maintain a comfortable and effortless grip on the canister during your entire outing. The loop also keeps the spray accessible and ready-to-fire. Unlike a typical spray, this gel formula will not blow back into your face in the wind and can reach an attacker as far away as 10 feet. This product has a four-year shelf life and contains dye to assist with suspect identification. As a male, I carry this as EDC spray. I simply removed the canister from the holder and it fits well in my front right pocket. I haven't had any issues with false sprays and have carried it for several years. 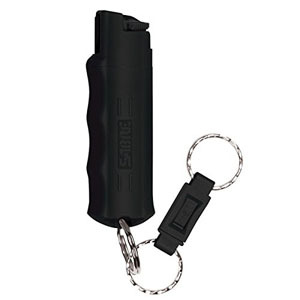 The SABRE Red Key Case Pepper Spray with Quick Release Key Ring is part of their “on the go” line and comes in black, pink, or red. The “quick release” allows you to detach the canister from the rest of the key ring which comes in handy if your key is stuck in a lock or your car ignition when you need to fend off an attacker. This spray sends a blast that goes as far as ten feet. It is advertised to have a four-year shelf life and contains dye to assist with suspect identification. 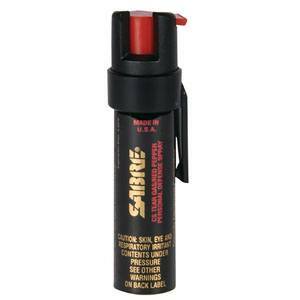 The SABRE Red Compact Pepper Spray with Clip contains more “sprays” of product than the previous two SABRE Red sprays discussed. The pepper spray stream has a ten foot range. It has all three red pepper, tear gas, and UV dye. This model is used by police and civilians alike, has a four-year shelf life, and contains dye to help authorities identify the suspect. With the flick of a finger, flip the safety switch to the right and you are ready to fire. It is definitely worth a look if you want a compact pepper spray that has a pocket clip—you can attach it to just about anything! 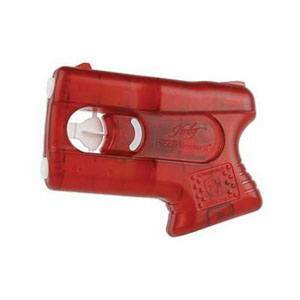 The SABRE Red Tactical Pepper Gel with Flip Top and Belt Holster has an impressively far blast range of 18 feet. This is a gel, meaning it can be used on a windy day without concern that it will blow back into your face if the wind direction is not ideal. Made in the US, this quality product expires four years from the manufacture date. Do not store this in your car during a hot summer—it should be kept under 120° Fahrenheit. The covered trigger prevents accidental discharge. It is a great unit to have around the house as a home defense tool. The gel gives you a much better chance of controlling the chemicals so that you don't contaminate yourself in a tactical situation. I keep one in several places in my home. The Police Magnum OC pepper spray is made in the US. This formula is extremely strong! It comes on a key ring for your convenience and has a red safety switch that you flip to the right before pressing down firmly to fire. The safety switch can creep over and unlock through normal jostling, but I have never experienced an accidental discharge. This non-flammable formula contains dye to assist authorities with suspect identification. The canister has about one good blast’s worth of pepper spray and then it is spent! 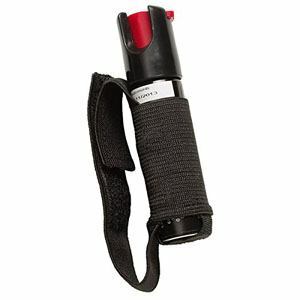 The SABRE Red “3-in-1” includes tear gas (1%), pepper spray, and UV dye. This unit includes a hard case. It comes with a detachable key ring attached to the bottom. There is a safety to prevent accidental discharge—flip it to the right and press down to use. You should fire bursts rather than hold the trigger down continuously. It has up to 25 sprays. This model comes in black, pink, and red. 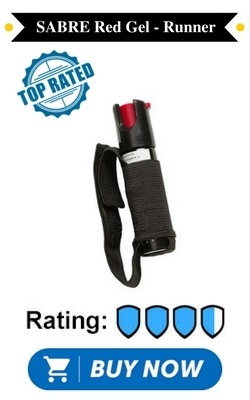 With SABRE Red’s excellent reputation and a four-year shelf life, you can be confident that this pepper spray will stop an attacking dog or person efficiently and effectively. 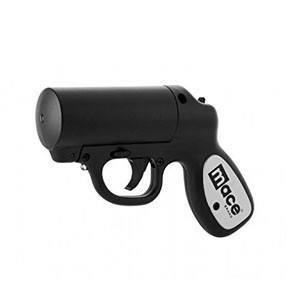 Shaped like a pistol and similar in size to a Smith & Wesson J-frame, the Mace Pepper Gun shoots about seven bursts of pepper spray (not gel) up to 25 feet. When you pull the trigger, a tiny LED light switches on and functions as a miniature flashlight. You can turn this light off by removing the battery from the gun. Refill cartridges are available for purchase. Did we mention it comes in many color options? 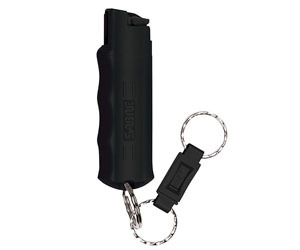 This pepper spray canister comes in a faux leather case with a key ring attached. The case is available in many colors including black, blue, pink camo, denim, purple, red, and zebra, and helps prevent accidental discharge. It is approximately four inches in length and fits easily into your jacket or jean pocket. The only complaint users have is that the snap on the case comes undone resulting in the canister coming loose. This formula contains UV dye. Remember to check your local laws before ordering. The Kimber Pepper Blaster has a shape that is reminiscent of a handgun. It has a small “grip” that you can get about one finger on and includes sights and a safety! At only one-inch thick, this one fits easily into your pocket. You can also purchase a holster for this pepper spray (sold separately). This one shoots a stream and has an approximate 13-foot range, two uses per gun, and four years of shelf life. It is not refillable. Buy a couple so you can practice your aim! For the ladies who need discreetness and style on top of protection, you cannot beat SABRE Red’s Lipstick. This pepper spray comes in a non-threatening lipstick-like canister. My lady says it is closer in size to a Chanel Rouge Coco Stylo than to a Chanel Rouge Lipstick (I'll take her word for it). She says it still fits easily in your pocket or purse. The only downside is that there is no clip, so you might have a hard time finding it in your purse when it comes time to use it. It has enough juice for ten bursts. The stream reaches up to ten feet away.